Located in Southeast Asia, the country of Thailand is famous for its food, its many Buddhist temples and landmarks and for being the world’s largest exporter of rice. 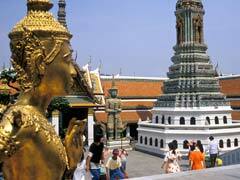 The capital of Bangkok and the surrounding areas also served as the backdrop for the blockbuster movie The Hangover 2. Bangkok is on the south coast of the country and is home to many temples, including Wat Pho, the Temple of the Reclining Buddha, the statue of which is 150 feet long, Wat Arun or the Temple of Dawn that has a decorated 70 foot spire and the Temple of the Emerald Buddha in the grounds of the Grand Palace which is one of the most valued temples in the country, with its emerald Buddha dating back to the 14th century. The Golden Mount or Wat Saket offers beautiful views alongside the massive golden mount and the Temple of the Golden Buddha or Wat Traimit features a solid gold statue that weighs 5.5 tons. All of these make for spectacular Thailand tourist attractions as all have something a little different to discover within their walls. Thailand tourism doesn’t just rely on the many temples and religious sites that dot the country, but also the many historic places of interest like the Vimanmek Mansion which is the largest teak structure in the world. Here people traveling to Thailand can take a tour of the mansion and grounds and take in the stunning mix of Victorian and Thai architecture as well as artifacts from the royal families that lived there. The Museum of Siam is an interesting place to go to learn about the cultural history of the country while the Lumpini Park, the oldest and largest green space in the city offers respite from the hustle and bustle of Bangkok while offering trails, a boating lake and playgrounds. Not far from the bustling capital city are the beaches of Pattaya, a lovely destination for your Thailand vacation that sits of the Gulf of Thailand. 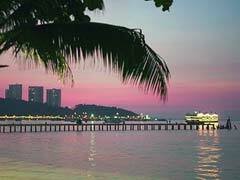 Pattaya beach, a 4 km expanse of sand complete with clear waters is also the hub of activities both day and night with discos, restaurants, bars, palm trees and water sports galore. Close by is the Underwater World Aquarium which is fun for all ages. Jomtien Beach is another popular Thailand tourist attraction known for its perfect windsurfing conditions, great places to dive or snorkel, and the big amusement park at the end that is perfect for the whole family to enjoy. If you are traveling to Thailand, make sure you don’t miss the Pattaya Floating Market, the orchid farm or the elephant village which are all close by Jomtien Beach. 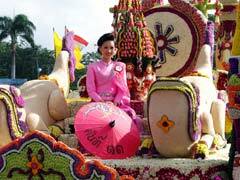 A Thailand vacation to Phuket, a west coast island allows visitors to see twenty nine Buddhist temples including their most important one, Wat Chalong which is dedicated to two monks who in an 1876 rebellion came to the aid of the injured with their knowledge of herbal remedies. After the religious sites, your trip can extend to Phang Nga Bay filled with spectacular scenery including limestone cliffs, caves, lagoons and beaches. Here tourists can take a sea cave canoe trip to see the formations and caves from a whole other angle. One of the islands located in the Phang Nga Bay is nicknamed James Bond Island because of one of the 007 movies filmed here in the 70s which can be reached by boat. The area boasts great snorkeling opportunities, tropical beaches and breathtaking scenery. If you are traveling to Thailand with kids, you won’t want to miss Splash Jungle Waterpark with waterslides, a lazy river and lots of water activities and a dedicated kids’ area for family style fun in the sun. 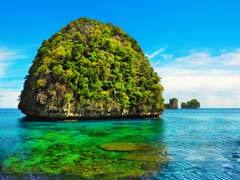 Another island not far from the island of Phuket is Koh Phi Phi Don where the scuba and snorkeling sites are plenty amid the pretty corals and multitude of marine life. 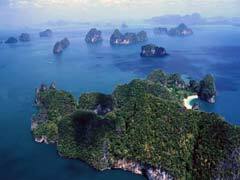 Fans, corals, caves, and leopard sharks all make this a great getaway and another gem of Thailand tourism. Maya Bay is also off of this island and features soaring limestone cliffs, coral reefs and beautiful beaches all in the setting used in the movie The Beach. There are plenty of Thailand tourist attractions on the east side of the Thai peninsula as well, notably the Angthong National Park in Koh Samui. This area features over 40 islands (or large rocks), limestone monoliths and is a great place to snorkel. Koh Samui also boasts many spas including fish spas where thousands of little fish clean your skin, and they too have a water park perfect for everyone in the family in the Coco Splash Waterpark where kids will love the slides and other watery activities. Adventures in Krabi for those on a Thailand vacation include the Tree Top Adventure Park where guests can swing high above the trees, go on rope bridges, check out Tarzan style swings or go on giant zip lines. Krabi is also home to Railay Beach where you can go rock climbing, caving, snorkeling or just sit back and admire the towering limestone cliffs. Tiger Cave Temple or Wat Tham Sua is also for the adventurous traveler to Thailand as it is a temple complex set amid a maze of natural caves in the jungle. 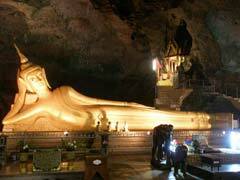 Although it is a religious site and home to monks, it is also an interesting place to explore. The south of the country doesn’t hold all of the Thailand tourism offerings for the whole nation, as is evidenced in a trip to the lower northern area to see the Sukhothai Historical Park, a World Heritage Site that is the site of the old city, ruins of palaces, temples, gates and walls can all be seen where they once stood centuries ago. A visit on your Thailand vacation to Chiang Mai can lead you to yet another of Thailand’s tourist attractions where you can take an elephant ride, take in the culinary and cultural delights of the country and travel to where Burma, Laos and Thailand meet, in an area called the Golden Triangle. Chiang Mai is also the home to the National Museum where guests can take in the history of the region and the kingdom of Lanna. Thailand’s tourism is booming, and with so many interesting religious and natural wonders to explore it isn’t any wonder why.